Will I be seeing you all at MAGIC Live? It seems unlikely as I won't be there. Please remember this post and feel free to put it into action. If you're not in a position to sing or hum, you can use this code phrase to secretly let people know you're a Jerx reader: "Sure, the history books might tell you the holocaust really happened... but my research suggests otherwise." Whenever a magician dies, I consider stopping this site just to start the rumor that they were behind this. Does the pattern on the suit help hide her situation? There's probably some element of stage illusion design baked in there, I'm guessing. Mentioning Pass at Red in last Friday's post inspired me to play around with it again. One idea I tried was using blank cards instead of jokers, marked up in the following way. This is the true nature of each card. After the pass I would take the deck in right-hand biddle grip and gesture outwards with my hands and when they came back together I would have rotated the deck 180 degrees. So when I spread again it would still seem the same with the Upper Limit and Lower Limit cards in place. I think this adds a layer of deceptiveness. It feels, even to me as the performer, very fair. Like that chunk of cards in the middle is isolated and can't change. Of course blank cards with words on them is much less organic than jokers, so it might not be worth the trade off. I actually presented it as an exercise I was practicing to learn card forcing. That there was a program I was involved in that would send you different parameters to practice with every day. "You don't just learn to force 1 card out of 52, you build up to that. So they might have you practice forcing 1 card out of 2. Or forcing someone not to pick one specific card out of 20." I like this concept. It's interesting and almost believable. It's sort of like the idea of a Workout of the Day in Crossfit. But it's some secret program where you can learn sleight-of-hand techniques. And because people already know the basic concept of card forcing, it's not like you're exposing anything. In fact, this trick would just muddy their understanding of how that works (given that you're not actually forcing anything at all). And it helps justify the Upper/Lower Limit cards—like they're just part of the guidelines for this particular SPOD (Sleight Practice of the Day). Originally I tried to play it off like I completely screwed up. That I was trying to force any three cards other than the three black ones in the red half. And instead they got all three black cards. But that seemed to be too backwards for people to wrap their heads around. So instead I upped the impossibility to an absurd extent. The first card was selected from a spread in my hands. The second was selected from a spread on the table. And the third by the spectator tossing a matchstick from a few feet away onto the spread on the table and the selection being whatever card the match-head was touching or pointing at. The idea that the second and especially third selection could somehow be a force is what pushed this into the realm of the ridiculous. It definitely fooled people. And I like the SPOD idea, but I don't know if it will make it into my regular repertoire. It's a little too magician centric for my style. But I may play around with it and take it in a different direction. We're coming up on the year anniversary of the release of The Jerx, Volume One. If you are someone who asked me to hold a copy and haven't paid in full yet, just know that those reserves have started to expire. If you don't want your copy to go to one of the people on the waiting list, then contact me. 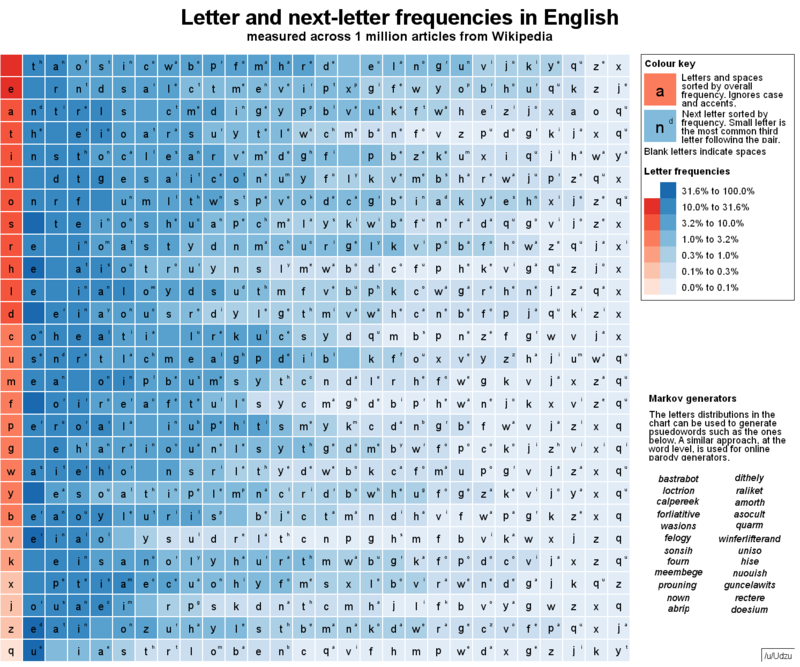 Here's a chart that lists letter frequency and next letter frequency for words in English. It could be of use when designing some mentalism routines. Or, you could use it overtly. Pull out a printed version of the chart. Your spectator is thinking of a word that you either forced or peeked in some way. "Is there an E in it?" you ask. Now you consult the chart, start crossing out rows and columns and connecting letters with lines. "Are you thinking of the word beagle?" you ask. When they're wondering how you could have known that you say, "Oh, well you said it had an E in it, so I just followed the chart." Like that explains it. A few people have written me suggesting using a Chinese lantern instead of a helium balloon for Faith (JAMM #6) and Little Faith (JAMM #7). I think that would be cool, and could look great. But I think it would likely illuminate something you don't want it to with Faith. For Little Faith there would be no issue with it. Although it's a little less organic, because, while helium balloons normally have a string or ribbon dangling down, lanterns don't. This has nothing to do with magic, but If you're a guy trying to come up with some shared activity to rope in some girl you like, I have a suggestion. I'm on an email chain with 4 male and 8 female friends. I said, "Hey, do any of you want to go as ABBA circa this 1975 performance of SOS for Halloween this year?" And I have never witnessed girls more enthusiastic about anything. All 8 of them are now positioning themselves to be my Agnetha and Frida. I'm not saying they want to do this to be around me. I'm saying they want to have the 70s hair, and those boots, and wear that dog or cat outfit, swing their hips and sing ABBA songs all night. So if you're looking for some kind of outing to get some quality time with a woman you're interested in, I think the ABBA halloween option might work well. From my limited experience it has a pretty high hit rate. I think a good kicker ending would be to take a cue from Paul Harris' Uncanny or Shigeo Takagi's Solid Cup routine and at the end you say, "In fact, there's no way I could have put the pea under this poo at all." And you turn it over to show that it's packed solid with your real human feces. My friend has a little gumball machine in his house and I literally ate a half-pound of gumballs while trying to come up with some tricks with them. Like "eat" in the sense of literally chewing and swallowing them. I may be dead by Monday as I try and push this through my colon. If this is my last post, hey, it's been real. When I was 8, and playing Little League baseball, one of my teammates died in a car crash. At the team meeting that followed, my coach said, "I guess god needed a left-fielder." So, to paraphrase him, if I end up dying from eating a half-pound of gumballs, "I guess god needed a moron." See you next week (maybe).